Cookies and punch on a table across the back, folding chairs in lines across the industrial carpet, bulletin boards with flyers and happy images: I was in a church hall. Suburbia USA. I was at a talk on masculinity and femininity. The presenter was a friend of mine, a quiet soul who comes to life when giving presentations. I was the chauffeur. I enjoyed watching her in action. She used simple, relatable ideas to talk about profound topics. 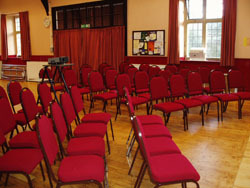 It was engaging and smart and light-hearted. As she wrapped things up, much of the group lingered. People lined up to speak with her individually or in small groups. I hovered at the back of the room and kept an eye on her book table. I had had a long day. I was tired…even more so, exhausted. My graduate program was doing a special week of talks from visiting professors and I had just sat through hours and hours of lectures. Days and days of trying to wrap my head around challenging content had worn me out. One of the ladies also hovering at the back of the room struck up a conversation with me. But, I was polite and put on a happy face. Chatting began. I just didn’t want to. It was too much. I was too tired. The topics were too sensitive. 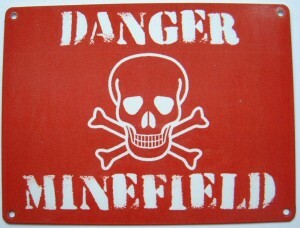 The possibility of walking into a minefield was way too high. I mumbled something and dodged the conversation. I’ve thought about that moment for months. I feel guilty for not going there, for having a good opportunity where real conversation was possible and avoiding it. I can cut myself some slack but haven’t let it go quite yet. By personality, I am a peacemaker….or so I’ve been told. I would prefer to think of myself as a courageous warrior and maybe I’ve had a few quick moments of glowing bravery. However, my day to day manner is quiet, easy-going, and eager to avoid an argument. The challenge is that I am a peacemaker in a pluralistic culture. And the issues of our country and our time are deeply divisive. I am a peacemaker who has well-formed ideas that many others don’t agree with. And tragically, I am a peacemaker who feels despairing about the state of our conversations. I’m from Arizona. My experience of seasons is subtle: hot, super hot, super crazy hot. Looking for inspiration for this month’s theme, I googled “seasons.” “Seasons Greetings” was near the top of the list. (As was “Seasons of Love” which is now an earworm in my head.) “Seasons Greetings” is tied to my story of dodging a sensitive conversation in a way that I can’t fully articulate. It represents the “should” in the art of conversation. There is something beautiful about the inclusivity of “Seasons Greetings”–that we’ve developed a phrase that embraces the variety of cultural traditions in our country. I went to a Kwanzaa dance celebration last year and was aware when Hanukkah started. And, in my heart and practices, I’m a “Merry Christmas” girl. Perhaps its just the turbulence of a cultural shift in majority and minority opinion–the burden of the “Post-Christian era” that intellectuals write about. Maybe it’s that I am a sensitive soul who would prefer that everyone got along and I live in a culture deeply divided. Perhaps all of my studies on the nature of man and of the state and of freedom and so on have made me think in a language I can’t converse in yet. Maybe the simple fact is that I want people to like me. Whatever may be the case, I’m unsettled. And, frankly, a little afraid. I am Mary, hear me…speak. This entry was posted in Season & Place and tagged Church Hall, Minefield, Peacemakers, Seasons Greetings, Speaking. Bookmark the permalink. ← Eight-and-One-Half Signs that Spring Might Come. Someday. Maybe. oh, so relate to this. especially the “peacemaker in a pluralistic culture” paragraph. I’ve backed away from so many conversations in the past few months (since I’ve transitioned to mostly being around people far more conservative than I) because I just don’t have the energy to bring out my opinions into an arena where so many people don’t seem to consider other povs as valid options. I don’t necessarily like that part of me that backs away from conversations, it feels snobbish . But, it’s been a survival mechanism that I’ve employed. Wonderful writing, Mary. I love your warrior’s cry. I think I shall adopt it as mine every time I sit down to write. Mary, I love this idea that we learn to think in languages that we don’t yet know how to speak. I often feel this way when writing, and am so grateful that you and I have a platform to try (and try again) to put words to things. Speak!